The Manchester to Leeds train takes 55 mins. On the round trip I completed 3 parsnips. 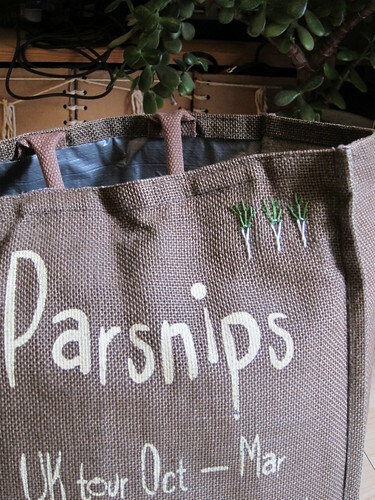 The plastic lining on my Parsnips bag (the replacement of the not yet mended Make do and Mend bag) was tearing away at the top. A bit of duck tape nearly solved the problem, but it didn't stick in the bits where the lining had come completely away from the fabric. Obviously, this was a situation for a bit of embroidery. Some green fly stitch and straight stitch, with a white detatched crossed chain stitch laced through. It looks enough like a pasnip to satisfy me. But I am a bit surprised that it takes me so long to stich them. Oh, and yes, embroidering through duck tape does leave sticky stuff on the needle, but it scrapes off easily. What a useful thing to know!